Time has stopped in Watch Hill, Rhode Island, which is what makes it—and its restaurants—nice. Watch Hill's most famous place to dine is undoubtedly the Olympia Tea Room, in a row of shops on Bay Street in the town center (map). 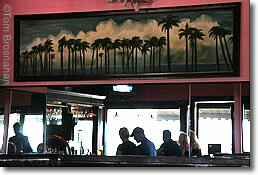 The Olympia is an authentic early 20th-century seaside-resort soda-fountain café, with black-and-white checkerboard floor tiles, well-used wooden booths, a few sidewalk tables, and waitresses in black dresses with white aprons. The atmosphere is refreshingly real, not "re-created." On fine summer days the prime place to sit is at one of the sidewalk tables, of course. The rule is hover and pounce: spot people near the end of their meal, move as close as possible without disturbing, then move in with determination when they rise from their seats. As for the food, there's plenty of it, and it's more up to date: sauteed shrimp with feta cheese, clam stew, chicken fajitas with hot tortillas and guacamole, bouillabaisse, and of course, lots of seafood, from clams and sausages on linguine to boiled lobster. Legend has it that Taylor Swift will wander in with friends every now and then, but the staff have been prompted not to make a fuss, and not to discuss celebrity visits, but to protect their privacy. 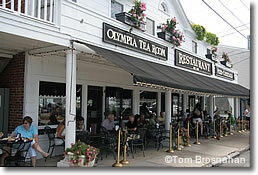 The Olympia Tea Room is a wonderful bit of old New England, lovingly preserved for us all to enjoy.